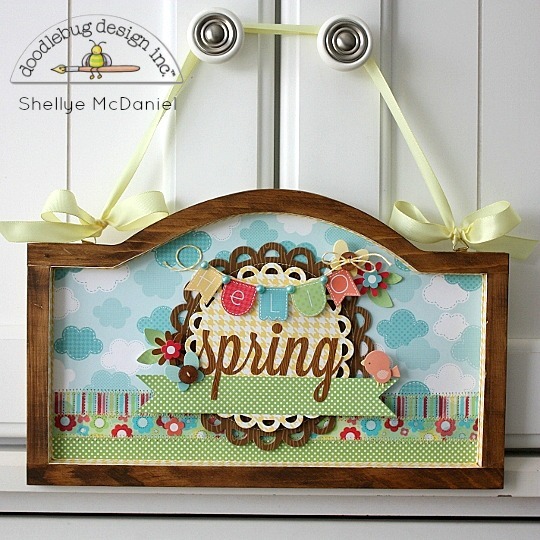 Whimsy by Shellye: Hello Spring! 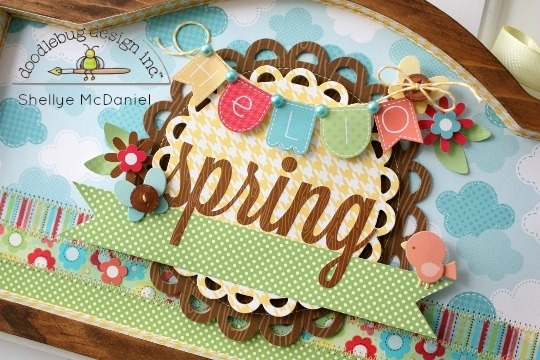 It's all things Flower Box Collection at Doodlebug Designs this week! For my project, I altered an inexpensive wooden frame that I found at Hobby Lobby. For the wooden frame, I used a brown chalk-style ink pad to distress the wood. trace onto desired patterned paper and cut out. For added dimension and interest, I trimmed out the inner edge with a strip of patterned paper followed by a border of Bumblebee Doodle Twine (I use a Fine-Tip Glue Pen for this). I added a row of washi tape and strip of paper to the bottom to mimic a ground full of Spring flowers. several of the Doodle Pops and cardstock stickers from the Flower Box Collection! A ribbon hanger to the top and it's ready for hanging. Many more Flower Box projects to check out at the Doodlebug Blog. Beautiful frame!! The papers are so pretty and love the doily die cuts and cute banner! This is so adorable!!! It makes me happy!! !